Darrell Blatchley pulling plastic out of the young male curvier beaked whale Photograph by Darrell Blatchley of the D’ Bone Collector Museum. A whale that washed up off Mindanao died from “gastric shock” after swallowing about 80 pounds of plastic bags and other trash. Marine biologists and volunteers from the D’Bone Collector Museum in Davao City were shocked to discover the cause of death for the young Cuvier beaked whale, which washed ashore on Saturday (March 16). In a statement on their Facebook page today (Monday, March 18), the museum said they uncovered “40 kilos of plastic bags, including 16 rice sacks, 4 banana plantation style bags and multiple shopping bags” in the whale’s stomach after conducting an autopsy. Images from the autopsy showed endless piles of rubbish being pulled from the inside of the animal, which was said to have died from “gastric shock” after ingesting all the waste plastic. 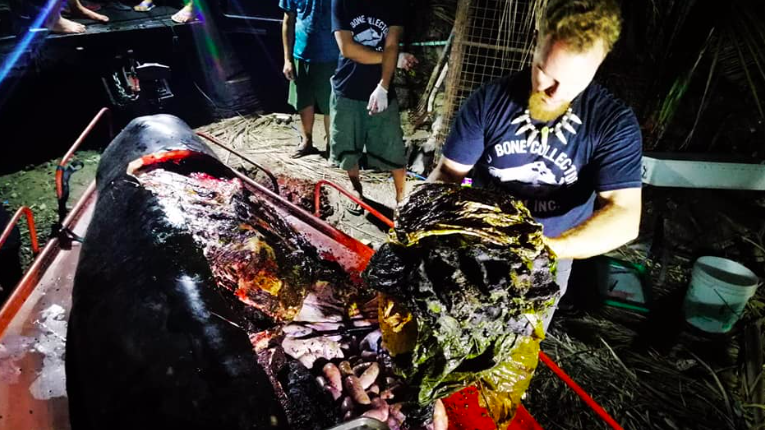 Marine biologist Darrell Blatchley, who owns the D’Bone Collector Museum, said that in the 10 years they had conducted autopsies on whales and dolphins, 57 of them were found to have died due to accumulated rubbish and plastic in their stomachs. In August last year we reported on another autopsy performed by Mr Blatchley on a whale shark that washed up in Tagum City. The cause of death in this case was also plastic ingestion. The use and careless disposal of plastic is a blight on Southeast Asia. A 2017 report by Greenpeace named the Philippines as the third biggest source of plastic pollution in the world’s oceans.